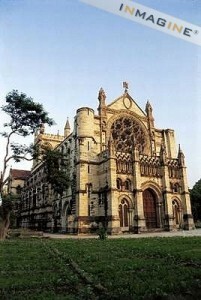 This church has been described as the finest Anglican Cathedral in Asia is faced in white stone with red stone dressing situated in Allahabad. No one visiting the Cathedral can failed to be impressed by the beauty of the marble alter with intricate inlay and mosaic work. The central panel presents the crucification with figures of Virgin Marry and St. John at the base. The other figures are St. Mathew, St. Mark, St. Luke and have the two Martyrs. Following the 13th Gothic style this Cathedral is a remarkable example of colonial architecture of that era. This entry was posted in Cathedral, Uttar Pradesh and tagged Church. Bookmark the permalink.